It's a rare, heartbreaking disease. Niemann-Pick Type C — which is often called "childhood Alzheimer's" because its adolescent victims deteriorate mentally as well as physically — lacks a cure or even a treatment. Patients most severely affected by the rare, hereditary, neurodegenerative disorder generally don't live beyond age 20. "We're also starting to realize that it's usually misdiagnosed," notes Dr. Frederick Maxfield '77, chair of the Department of Biochemistry and the Vladimir Horowitz and Wanda Toscanini Horowitz Distinguished Professor in Neuroscience. "In the United States and Western Europe, it takes an average of five years from the first doctor visit to a correct diagnosis." It's a paradox that many researchers are all too familiar with — a form of scientific limbo known as the "valley of death." "The attitude was, 'This is interesting academic science, but you'll never be able to take it to the next level,'" Dr. Maxfield recalls. "So for three years it just sat there. It was frustrating, because I did think it had potential. "In 2009, Dr. Maxfield — who has been investigating the disease for more than a decade — developed some theories about how to enhance an existing experimental therapy for Niemann-Pick, which strikes just one in 150,000 people. Tests in his lab showed promise, but when Dr. Maxfield sought funding for further exploration, he was told that his ideas were too preliminary to attract much interest from pharmaceutical companies or granting agencies. Without the money to cover the next stages of analysis, he couldn't move the project forward. Then, in fall 2013, Weill Cornell Medicine joined Memorial Sloan Kettering Cancer Center and The Rockefeller University to form the Tri-Institutional Therapeutics Discovery Institute (Tri-I TDI), a nonprofit devoted to fast-tracking early-stage drug development. Founded by two major gifts from Weill Cornell Medicine overseers — $15 million from Lewis and Ali Sanders and $5 million from Howard and Abby Milstein — Tri-I TDI is a kind of incubator whose goal is to transform fledgling discoveries into promising treatments for some of the world's deadliest diseases, bringing them to the proof-of-concept stage where drug companies might invest in them for further development. At the time of its founding, the institute announced that it had formed an alliance with an industry leader: Japan's largest pharmaceutical firm, Takeda Pharmaceutical Company Ltd.
Last year, Dr. Maxfield's project was one of seven the institute accepted — out of four dozen applicants from the three institutions — for additional financing and support. 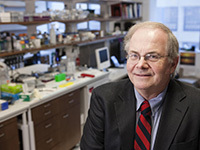 As with Niemann-Pick, "In some cases we were looking at significant unmet medical needs," Dr. Gregory Petsko, the Arthur J. Mahon Professor of Neuroscience at Weill Cornell Medicine and a member of the institute's scientific advisory board, says of the first round of projects. "That means if anything comes of this, it would really help people. That's really exciting." The institute's director, Dr. Michael Foley, an assistant professor of biochemistry — who has worked at Harvard, MIT, Bristol-Myers Squibb, and GlaxoSmithKline — is equally enthusiastic. "As far as I'm concerned," says Dr. Foley, "there's unlimited opportunity here." Traditionally, drug development has been a complex, costly and disjointed process, with a wide chasm separating academia and industry. For corporations, it's usually not practical to hire squads of researchers to work at the early stages of drug discovery. And most academic scientists aren't experts in medicinal chemistry, a specific skill set needed to bring a drug to the marketplace. "To approve one drug, it typically takes 13 and a half years and costs approximately $1.8 billion," Dr. Foley says, then adds: "That's billion, with a 'b.'" Under the old system, researchers with fresh insights into a disease might identify and create an innovative compound with great therapeutic potential. After showing so-called "proof of principle" — meaning that the drug would likely have real-world applications — they'd hand it off to an interested company. But there would be little interaction between the two sides after that, even as a firm's own scientists worked to smooth the compound's flaws. In recent years, though, there has been a growing recognition of the need to bridge this gap, with many pharmaceutical companies trying to strike up relationships with academia earlier on. "The new idea is that you work together as partners," says Dr. Carl Nathan, chairman of the Department of Microbiology and Immunology and one of Tri-I TDI's board members. "Academics are good at thinking about problems in new ways. We develop new technologies that may break open a problem, but we're not so good at the rest of it. The things we need from each other are complementary." 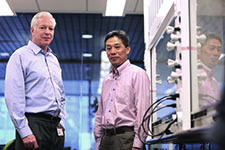 Academia and industry: Tri-I TDI director Dr. Michael Foley, left, with Dr. Kazuyoshi Aso, vice president of medicinal chemistry. Among the more unique aspects of the Tri-I TDI partnership is the collaboration among three renowned institutions, all located in the same Upper East Side neighborhood. Not only does the joint effort allow them to share the cost of salaries, equipment and other operating expenses, it offers valuable economies of scale. "You just widen the funnel for great ideas," Dr. Foley says. "Setting up three of these — having three CEOs and three directors working with three different companies — would be tripling the expense with no improvement in efficiency." And while similar efforts generally target one specific illness, Tri-I TDI can address a variety of maladies, from widespread health challenges like cancer and malaria to conditions such as Niemann-Pick, which affect only a small number of people. Research proposals are chosen based on scientific potential, not future profitability. "I could have a great idea for a drug for tuberculosis — which almost 1.5 million people a year are dying from — and a company might say, 'Yes, but they're all poor, so we don't see a market for that,'" Dr. Nathan says. "At this institute, we don't have those kinds of conversations. That's why this is so different." As Tri-I TDI's industry partner, Takeda — which has assigned 15 full-time medicinal chemists to the effort — embraces every project that the institute takes on. The Takeda scientists become part of a principal investigator's research team, in the belief that close collaboration will accelerate discovery. And indeed, if Dr. Maxfield is stuck on a problem and feels like brainstorming, he only has to walk across the street from his Weill Cornell Medicine office and go to the top floor of the Belfer Research Building, where the Tri-I TDI lab is housed. There, he can meet face-to-face with the Takeda chemists, which he says has pushed his research along faster than he and his academic collaborators could have achieved alone. "Every two weeks or so, we have a meeting and we get anywhere from three to 10 new compounds to test," he says. "It's incredible." One recent morning, Dr. Maxfield stopped by to check in with Dr. Yoshiyuki Fukase, his project's lead chemist and Tri-I TDI's director of medicinal chemistry. In the pristine, all-white-and-glass lab, he watches one scientist input data about their latest compound on a laptop. Another hunches under a fume hood, wearing protective goggles to carefully mix a cocktail of chemicals. Dr. Maxfield's group is attempting to modify cyclodextrin, a sugar-based substance that the NIH is studying as a remedy for Niemann-Pick. Those with the disease can't properly process cholesterol, which eventually accumulates to toxic levels. Cyclodextrin seems to reduce the cholesterol and prolong survival — but in the form now being tested on young patients, it must be given in high doses, which can trigger devastating side effects like hearing loss. Plus, the blood-brain barrier prevents the medication from reaching the most-affected cells — the neurons — so it must be injected directly into the brain. "We're trying to see if we can link something to the cyclodextrin that will allow it to get shuttled from the peripheral blood into the cerebrospinal fluid," Dr. Maxfield explains. "By doing that, you could hopefully get enough into the brain to be effective." Aiming to improve upon the results of their first round of tests, his team is tinkering with their initial compounds in the hope that new formulations will bind more tightly to cells. Says Dr. Nathan: "The close interaction with the TDI chemists lets us make improvements on the fly." According to Dr. Kazuyoshi Aso, Tri-I TDI's vice president of medicinal chemistry, the institute is giving Takeda scientists experience unlike anything they'd encountered in a corporate environment. The principal investigators and their lab members, Dr. Aso notes, have different perspectives on drug discovery research from their counterparts at pharmaceutical companies. "We can learn a lot of cutting-edge science from these academic institutions," Dr. Aso says. "And on the other hand, our role is to teach both the drug discovery process and the concepts of drug design." The effort is a stunning commitment by the Takeda scientists: all moved from Japan to New York, where they'll spend from one to three years. In some cases, workers left spouses and children behind to pursue the opportunity. For Weill Cornell Medicine, Sloan Kettering, and Rockefeller, a major advantage of the arrangement is that intellectual property rights remain with the institution whose faculty originated the proposal. In return, Takeda gets inside knowledge about the targets and drugs in Tri-I TDI's pipeline, along with first crack at negotiating licenses — though there is no obligation to accept Takeda's offer. Either way, Dr. Nathan believes the institutions will likely receive a higher royalty rate than usual, since a company would be buying a compound with fewer liabilities. "We'll be adding enormous value to the project," he says. "We'll already have shown that it seems to work." Dr.Yariv Houvras, right, with Dr. Ritu Kumar, an assistant professor of cell and developmental biology in surgery. One Tri-I TDI drug that seems particularly promising is being studied by Dr. Enrique Rodriguez-Boulan, the Charles and Margaret Dyson Professor of Ophthalmic Research. As it happens, some of the same compounds that Dr. Maxfield is using in his Niemann-Pick project have been shown by Dr. Rodriguez-Boulan and his team to be promising therapeutic agents for Stargardt Disease (SD), an incurable type of juvenile blindness that affects about one in 10,000 children in the United States. Dr. Rodriguez-Boulan's rationale was akin to Dr. Maxfield's: he wondered if cyclodextrin could heal SD, after discovering that the substance also removes a toxic waste product that collects in patients' retinas. Working with Dr. Rodriguez-Boulan's team, the Tri-I TDI-sponsored chemists have already created and tested derivatives that are several times more efficient than current cyclodextrins in clearing the toxic lipid from cultured retinal cells. He's now doing experiments in model SD mice to gather evidence of whether these enhanced cyclodextrins can prevent vision loss and promote vision recovery after clearing the toxin from the retina. "If we can show we can protect them from blindness," he says, "then we're set to go on to humans." Dr. Rodriguez-Boulan adds that these drugs might also help with a more far-reaching condition: age-related macular degeneration (AMD), the leading cause of blindness in older Americans. "No one knows the exact cause, but as we get older, we accumulate this toxic lipid," he says. "So there's a good chance that at least some forms of AMD may be sensitive to this as well." For medical oncologist Dr. Yariv Houvras, an assistant professor of medicine, funding from Tri-I TDI came at the perfect time. His lab uses zebrafish as a model organism to study cancer; working with Dr. Minkui Luo, a Weill Cornell Medicine associate professor of pharmacology who leads a lab at Sloan Kettering, Dr. Houvras is targeting an enzyme called SET8, which is associated with the proliferation of cancer cells. After putting a small-molecule inhibitor of SET8 on zebrafish embryos, Dr. Houvras and his team saw a specific effect on melanocytes, the pigment cells that give rise to melanoma. "We believe that if we can interfere with that biochemical activity," he says, "we can stop cancer cells from growing." Yet the project faltered once the group got to the point of developing a preliminary chemical compound, prompting him to seek out Tri-I TDI — without whose intervention, Dr. Houvras believes, the research would still be at a standstill. "Compounds that work in cells, or will work in animals like zebrafish, usually don't have drug-like properties that would make them appropriate for treating humans," he says. "That's where the partnership with Takeda comes in. They can help turn compounds into actual drugs. That's an important goal, because ultimately we want to treat patients." While the length of funding for a Tri-I TDI project is determined on a case by case basis, Dr. Foley believes that for most, two years should be sufficient to determine whether continued investment is warranted. As projects exit the program — whether it's because a drug company licenses the technology or because investigators are unable to make progress — they will be replaced by another from the same institution, insuring that all three academic centers get an equal shot. The total number of ongoing projects will likely remain the same, between six and eight at a time. Dr. Petsko, for one, is astounded by how quickly the institute has generated interest among talented researchers. "We really expected this to take a while to ramp up," he says. "Nothing could be further from the truth." This story first appeared in Weill Cornell Medicine,Vol. 14, No. 2.